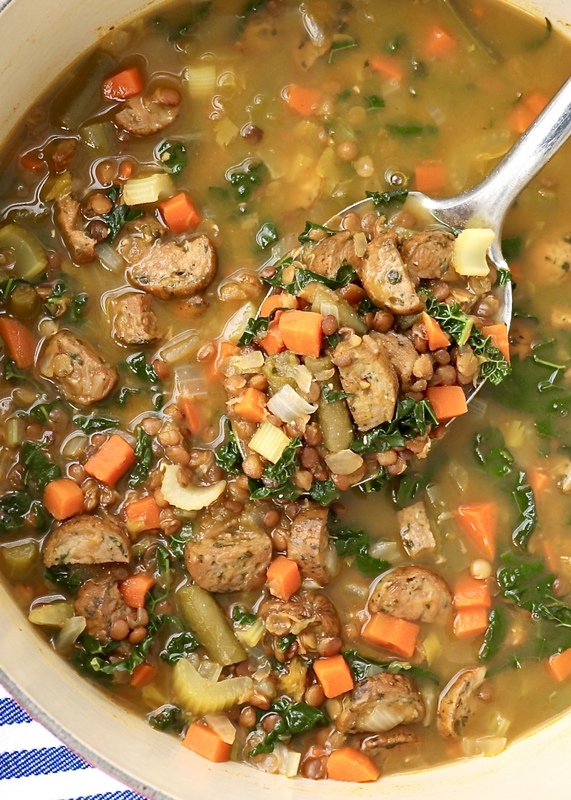 The dump-and-cook approach makes this healthy and hearty soup extra easy to prepare － and the flavor might just make it a new family favorite! Easily adapted for vegan diets, too. Who in your household does the weekly food shopping? If it’s you, what type of grocery shopper are you? Where do you go to check off the items on your weekly list? And is that list jotted on paper or contained within your trusty phone? The planners among us often manage to round up everything needed for the week ahead in one efficient trip. Others rely on several trips, piecing meals together a few days at time. In our household, the shopping is a shared job, and my husband and I actually enjoy it. He makes a weekly supermarket trip to stock up on key items. I prefer smaller, more frequent trips to a variety of larger stores and smaller markets. On Saturday mornings, we often start the day at the gym and then stop in Lemon Street Market for our favorite smoothie (the “Replenish”) and a bagful of grocery items. In addition to their extensive selection of fresh goods and pantry ingredients (often locally sourced), Lemon Street has a small café that sells an array of coffee beverages, smoothies, juices and soups. A nearby refrigerated section is always stocked with salads, quiches and a variety of ready-to-eat meals that appeal to shoppers who enjoy a healthy, home cooked meal, but prefer someone else do the cooking and cleanup! Last fall, I asked longtime kitchen manager Myra Horst what the most popular prepared food items are. Without hesitation she rattled off a number of soups, noting that the demand for the piping hot concoctions is especially high when the weather grows cold. 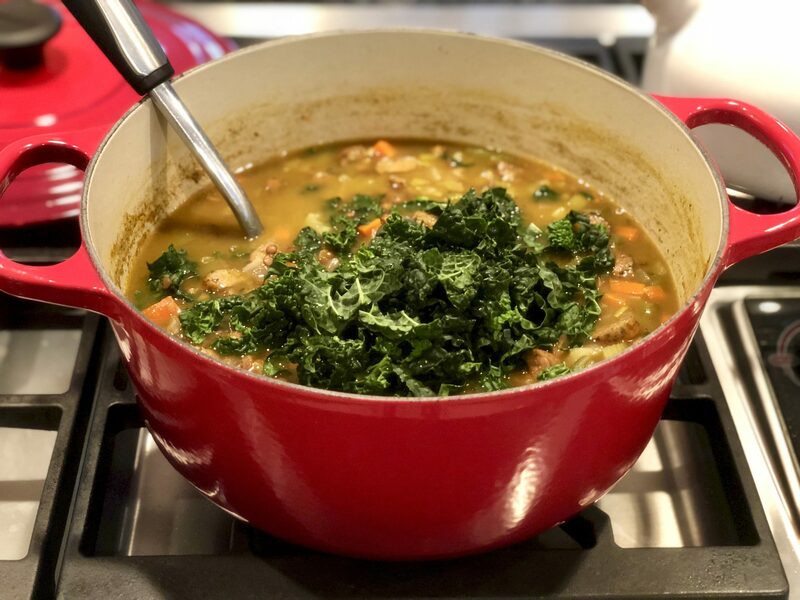 With the blessing of Lemon Street owner Trish Haverstick, Myra shared the trade secrets behind several of their fan favorites, including the following soup, which becomes decidedly more stew-like when prepared in advance and the lentils continue to absorb the flavorful broth. 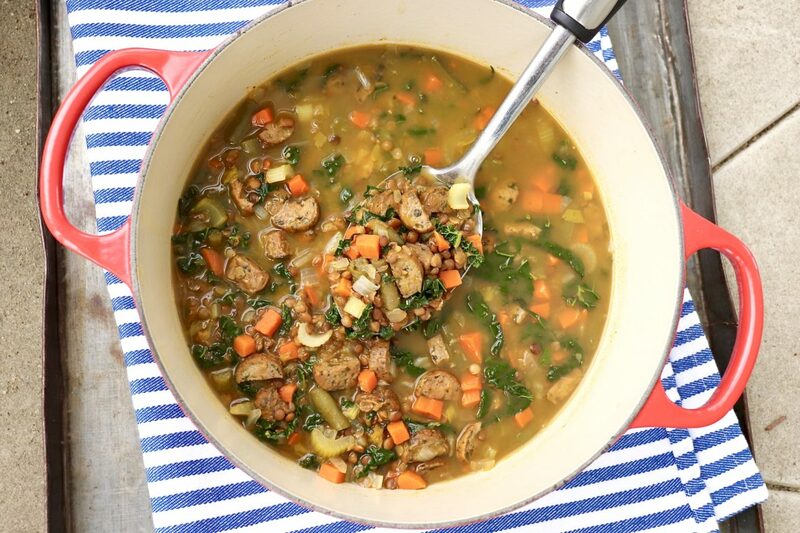 When the lentils are tender, add the greens to wilt and enjoy! Leftovers taste great and freeze well. Thanks to its ease of preparation, inherent flexibility, and all-around appeal, I’ve prepared a potful for my own family many times since. I especially like that it can be cooked in advance and served as an all-in-one meal. At the store, Myra prepares twice the amount indicated below, and that’s easy to do. (Note that the simmering time tends to be slightly longer.) I’ve made the bigger batch when sharing with a sick friend’s family and included a fresh baguette to round out the meal. 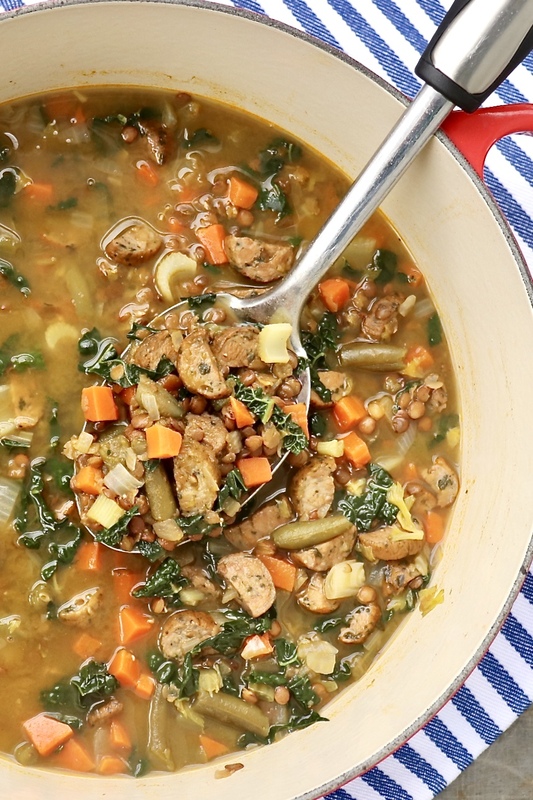 The dump-and-cook approach makes this healthy and hearty soup extra easy to prepare － and the flavor might just make it a new family favorite! 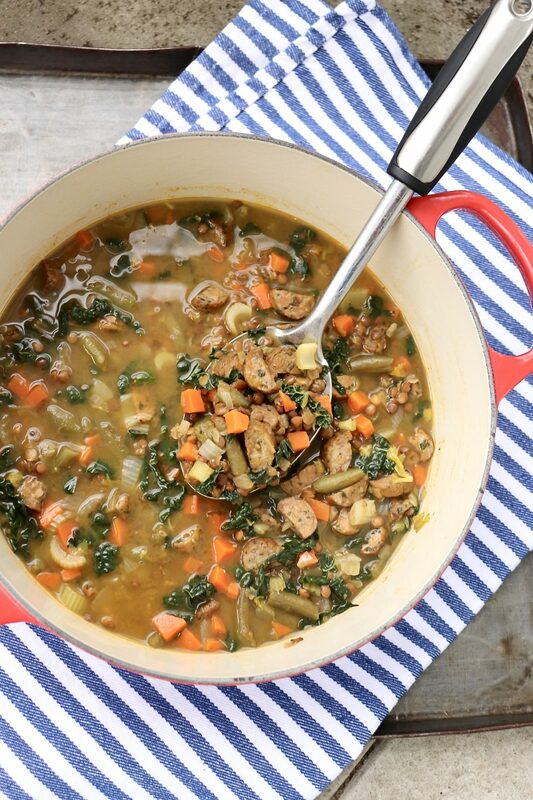 Place all ingredients except the kale in a large soup pot or Dutch oven. Bring to a boil, and then reduce the heat to maintain a gentle simmer. Cook, partially covered, until the lentils are just tender. Start checking after about 20-25 minutes. This usually takes about 30 minutes for me, but the precise time could be longer and will depend on age of lentils and precise level of heat. *I use Applegate brand chicken & turkey sausage and have also used their sweet Italian and spinach and feta sausage in this recipe. You could substitute your favorite pork sausage or one of the increasingly popular vegan alternatives for a meatless meal. For those who desire a vegan soup, Myra recommends Beyond Meat’s Brat Original, and I’ve also heard that Field Roast’s vegan sausage is quite good. 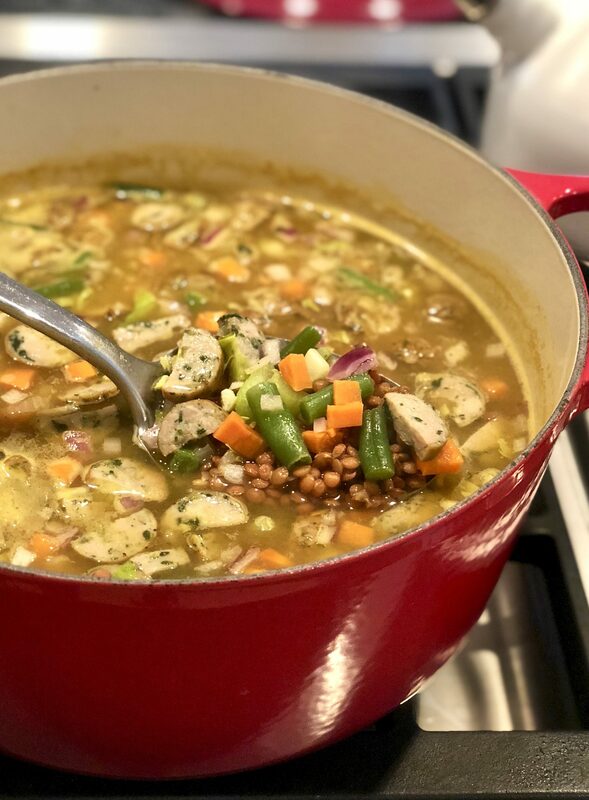 **I’ve made this soup with and without the green beans, so don’t go out of your way if you don’t have them on hand or simply don’t enjoy them. If using fresh, string and cut into bite-size pieces. When using frozen, I preferred chopped beans to whole and have found the texture to be more appealing when added in the last 5 minutes of cooking time. ***I use 2 cartons of Pacific’s low-sodium vegetable broth; you could substitute chicken broth if preferred. •Myra at Lemon Street regularly doubles the recipe for a larger yield and says it freezes well. 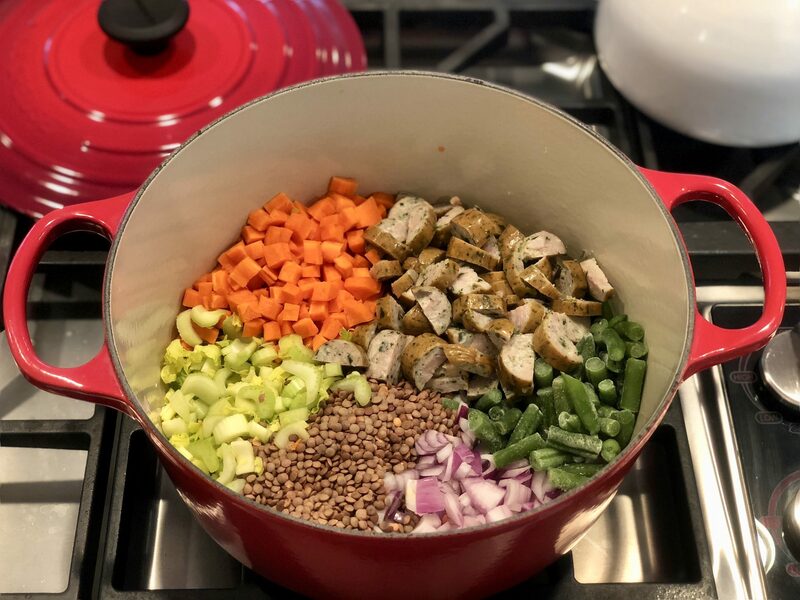 •For more flavor in every bite (and fewer big chunks that picky eaters might avoid), I like to dice the veggies fairly small. •If you have a Parmesan rind on hand, toss that into the pot, too. Garlic lovers could add 2-3 cloves of minced garlic, or more to taste. The dump-and-cook approach used in this recipe holds special appeal, and this soup doesn’t suffer much for the streamlined approach. For an added layer of flavor, however, you can start by heating 1½-2 tablespoons olive oil in the pot and sautéing the onion for 2-3 minutes, or until translucent. Then add the carrots and celery, sautéing for another 2 minutes. Stir in the cumin and oregano – this will allow the spices to “bloom” and coax out more flavor – and the sausage. Sauté a few minutes more – just enough to lightly sear the sausage – and THEN dump everything else into the pot and proceed as directed. Wow! Just saw this post and it looks so easy and comforting, especially for winter months. I am looking for one pot dishes for my mom that are easy to freeze, this looks like it fits the bill! I will try it and report back! Thanks for your comment and I hope you and you mom enjoy! Hi Ann, I went to Whole Foods and checked out the sausage You recommended but the sodium content in is so high I think it’s like 800 plus milligrams per sausage. Have you ever made this with just plain ground Turkey or ground chicken? Also if I wanted a thicker version I’m assuming I would just use less broth? Hi Dawn, Thanks for your question. I just checked a package that I happen to have on hand and, as you mention, the label indicates 790 grams of sodium per link. Another brand may certainly be used, and I think bulk sausage (chicken, turkey or pork) that has been browned first would be a terrific option. To completely eliminate the added sodium that comes with any sausage, ground chicken or turkey could be used as you ask. You may wish to enhance the flavor with some additional spices. Optionally, you could make my “homemade sausage” and use it as bulk sausage instead of forming into patties as shown. It really is a great option: https://fountainavenuekitchen.com/breakfast-sausage-patties/. I’d love to know how you make out! Oh, wow! Ann, this is delicious! I think this is one of my favorite things from Fountain Avenue Kitchen. I made this last night for tonight’s dinner. I followed your tips for sautéing the onion + other veggies, and letting the seasonings bloom. I browned my sausage in a separate pan and cleaned up that pan with water/broth. This was a hearty and yummy meal, way better than traditional vegetable soup. Thanks Ann for bringing us great recipes! You are very welcome, Harriett, and thank you for your lovely comment. I’ve heard such positive feedback about this meal in the last couple of weeks as I talk to people about town － and it’s been a hit here, too!